The Water Supply is an outside area inside of the Haunted Towers in Luigi's Mansion: Dark Moon. The Water Supply can only be accessed taking the door on the top floor of the Laboratories, where it becomes the Lounge. The Water Supply is a large area with the most notable item of interest being the large red machine located on the right side. The machine supplies water for the Hydro Generator, allowing it to create electricity. There is extensive plumbing coming from the machine, presumably supplying water throughout the machine. During B-1: A Job for a Plumber, Luigi needs to make his way to the Water Supply to get the Hydro Generator working again. When Luigi gets to the Water Supply, he is attacked by a Greenie that is using a bucket as a helmet. 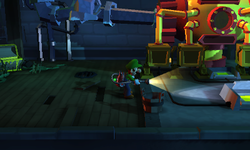 After defeating the Greenie and using the bucket to weigh down the switch, Luigi can activate the Water Supply machine. After activating the machine, Luigi is attacked by a Gobber. After its defeat, the mission is complete. In all other missions, there is nothing of significance in the Water Supply room. This page was last edited on May 1, 2017, at 21:09.